Viggo-Works - \"you carry it\"
Viggo-Works > Articles > Sobrevuelos 2011-2014 > "you carry it"
Viggo shares with us his third chat - full of azulgrana feeling - with writer Fabián Casas. Don´t miss it! I don´t think I told you this: last year I went to a doctor to have a colonoscopy for the first time. I guess this is not a subject you talk about just like that, but since we are friends...and it doesn´t bother me at all to talk about it...well, anyway, it was not because of anything serious that I had to go through that little medical exploration -just that they had told me it was time, that I should do it. That I was the right age...(and I who don´t think of that so much... I guess I keep running and going round as if I were a kid, I don´t know)... But, luckily, everything was alright. Right now I don´t have any extraterrestrial living in my most hidden interior. Well, it turns out that when I came out, when they took me to the room where they leave you to wake up from the anaesthetic, I started singing "SOOOY DE BOEDO, SOY DE BOEDO SOOOY, DE BOEDOO YO SOY ...!!! " 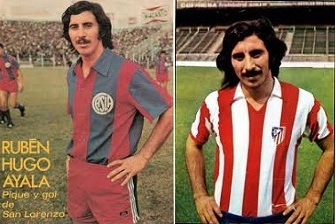 ["I´m from Boedo, I´m from Boedo I am, from Boedo I am...!!!"]. I don´t remember anything, but it seems I kept on singing this, again and again, at the top of my voice, and also part of "San Lorenzo es un sentimiento, no se explica, se lleva bien adentro..." [San Lorenzo is a feeling, it cannot be explained, you carry it deep inside..."].There was only one person nearby who understood Spanish, that´s how I knew later on about the absurd show I had staged in there. Suddenly I stopped singing and began to make the little bed where they had left me to recover, still rather sedated, folding the sheets, arranging the pillow, taking off that half-kimono thing that you have to put on in hospitals, folding it too..."Sir, no! Someone else here will do that when you go -leave it!... ", they said to me. "Put your clothes on and sit down, please." I don't remember any of it. I remember that when I left the hospital they told me everything I had done, that I had woken up half the world with the songs. Poor people...well, I'm the first to admit I don´t sing that well, even if I like to do it...the situation must have been utterly ridiculous. But I guess things like that often happen with those who are sedated; when we are left without defences and we don´t censor ourselves weird things usually come out, those that we carry deep inside. As you can see, the subconscious is very powerful. Even if it´s that of a gringo who was born far from Boedo. The story about the songs you sang when you came out from under the anesthetic was funny to me because just last night, while my wife was watering the plants on the terrace I was playing with Ana, who's walking already and who'll grab your hand and ask you to take her back and forth. It's strange, because she usually walks in circles and yesterday she was determined to go up and down a step that's between the grill and the other part of the terrace. The thing is, at one point she grabbed onto a railing that goes around the terrace and I got behind her and, as if we were on the pitch, I urged her on by singing San Lorenzo es un sentimiento / no se explica se lleva bien adentro. [San Lorenzo is a feeling / it cannot be explained you carry it deep inside] And I showed her how to wave her hand. I think my old man must have done the same thing with me. Suddenly my wife asked me: What are you doing? I'm teaching her a mantra, I told her. I remembered that Paul McCartney once said that he had a secret mantra that they taught him in India and that he used it to relax and fill himself with energy. My wife always points out that Ana is a little girl, and that she doesn't much like the idea of her going to the pitch, and even less the idea of her hanging from the paravalancha. [avalanche barrier: A little kind of railing, distributed through the area, for supporters to lean on.] But we'll see. In fact, if we had a son, I wanted to call him Sean Lorenzo Casas, and Guadalupe objects to that too. But anyway. I liked that el Turco Asad is giving the Youth Divisions a place. It seems to me that they feel the jersey (never, never, no matter how clear it might be, will I be able to understand the concept of 'professional'; it's hard for me to think that Gonzalo Bergessio, for example, came to work for Ciclón.) Today, before entering the dojo to go to karate, I read in the newspaper some statements from [the] D.T. [Director Técnico, a.k.a. coach] saying that "he had to take his hat off to Pipi Romagnoli", and that phrase brought me to tears. Pipi Romagnoli is and will always be, as William Buttler [sic] Yeats says in his poem 'Beautiful Lofty Things', "a thing never known again". Very beautiful what you say about your daughter, about the mantras, Fabián, the image I now have of your daughter hanging from the paravalanchas singing like a cuerva possessed by love of the holy colours. Sean Lorenzo! Will there be one out there, somewhere in the world, in Ireland for example, Yeats´ cradle? Surely there is, certainly there is a very handsome kid with this name, with a great future ahead of him. Now there is. I don't know whether Bergessio was such a mercenary, if that is what you are saying. Well, it's also true that he availed himself of the opportunity. 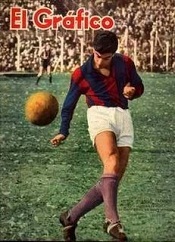 But at the end I think Gonzalo was sold by those who were the masters of his fate regarding San Lorenzo and his sporting career at that time, when he was playing very well, after the season where he achieved a great feat in the Monumental [stadium] in the decisive cup tournament match against River. It was a great year for him as a player, he attracted attention for his quickness, physical strength, and fighting spirit. Maybe he saw that as his best and only chance to try his luck in Europe. He says himself that he constantly follows CASLA, and that he supports the return to Boedo. A lot of harm has been done to our club and in other Argentinian clubs with all this selling of those who play well to foreign entities too quickly. Sometimes the kids go abroad and get injured, play badly at the beginning and never are up to the mark, they never help them to grow, they are wasted...and sometimes they come back as broken toys looking for a last chance in the local tournament. Sometimes they succeed, sometimes they don't. It must be hard to get injured, lose ease of movement, speed, the promise of youth. To have your eyes get dim, lower your gaze, and have your heart break. It must be tough for the cracks [translators' note: ace players] who get hardened and finally break down - often very few people remember their names, remember their first moments of glory. That's life, that's life. Hold on, goddammit...but I have all the respect in the world for those who make the effort to reach the first [division]. There's a similar phenomenon in my trade: the great and increasing number of awards to actors has the same result in filmmaking. Many of the talented actors who are just starting out do everything they can to shine personally, be ahead of their colleagues to win nominations, and more money, even more prizes, etc... Nothing about playing or acting for the greater good of the team. That's how I've seen it, in many cases at least. It's a sad reality. It's complicated for the players, I think - even those who are already great. I think that they rarely have as much control as we think, as much opportunity to decide if they want to stay with the team and the jersey they love - or at least the one that has nourished and given them fame in the media. Incredible what you are saying about actors (those who think only of their asses and understand acting as something individual and not collective) because just yesterday afternoon I was talking with Miguel Villafañe, my editor in Santiago Arcos, a rabid River supporter. And I was telling him about Beto Alonso, of how a brilliant, beautiful player had turned into a resentful and grey person, almost like a pus grenade, every time he has to speak on TV or the radio. The guy, I was saying to Miguel, was an amazing player, a luxury and a creative part of that gallina [River supporter's name] midfield in which Merlo and J. J. López also played, three guys who would split the midfield between them in a remarkable way without the need for a double five [tr. note: a tactic consisting of using two midfielders]. Viggo: in 1975 my dad took me to the field to see San Lorenzo against River. That day, Alonso really was amazing. He made the ball do anything. Up, down, sideways, nutmeg [tr. note: passing the ball between the opponent's legs], double nutmeg, backheel. They killed us with goals and I left holding my old man´s hand, crying. Never had beauty caused me so much pain. I now understand why Seymour Glass, Salinger's talisman character, throws stones at the face of the girl he likes. In that era, I told Miguel, the players used to play for a long time in their teams and they did it regularly. The championships were long, two-legged, and to win them you had to have kime. What is kime? It's that moment in karate in which your breathing, the blow and your mind metabolize into a single sense. That's flawlessness. Alonso had that flawlessness. Just like Coco, Fisher, Heredia, Jota Jota, Patota Potente and so many brilliant players of the seventies. That's why Beto is resentful, I told Miguel, because he sees that any player who's only spent seconds on the field is already a millionaire and is more concerned about all that accompanies soccer (groupies, trendy bars, clothing, hair gel, the tiniest and most modern cell phones, the pimped-out cars) than playing soccer and getting their knees skinned for their jersey. Alonso says to himself, I told Miguel, that after barely a year in Europe these kids earn more than I've earned in my whole life. Alonso says to himself, I told Miguel, that these kids don't know what it is to score two goals against Boca on its own field, with an orange ball, the only thing they think of is their own salvation. I've never thought of Bergessio as a mercenary, I thought of him as a professional and I found it hard to link that concept with a player who made me cry and lose my self-control (due to joy), the night we broke River's modern history in two. 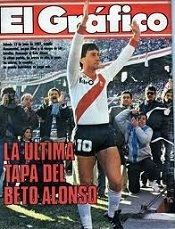 I love your description of the defeat against River, the wonder of that gallina team where Beto Alonso played. As you know, I missed a lot of things in the seventies and eighties due to my long absence since my brothers and I left for the United States with my mom. I´ve been finding out little by little since I returned to Argentina the year we became champions, guided by Bambi. It´s nice to be able to educate yourself with the help of talks with you and other supporters, with historic players (to have that GREAT luck being an actor, the chance to meet the Matadores and so many other great ones from San Lorenzo), with the laptop, reading, watching old matches, plays and goals, both glorious and painful moments, confirming again and again what the greatness and endurance of our shared azulgrana affliction is! Another thing I wanted to comment on is the Lorenzo Massa Chapel. You know that I helped the chapel be built there in CASLA´s Ciudad Deportiva. The idea was and is that it should be a place to meditate, pray, be quiet, maybe in good company, before and after our team matches. Well, there´s always a before and after for every match, no?...so whenever it´s possible, if the chapel should be open and a San Lorenzo supporter wishes to spend a few moments in it, or someone who comes in peace though they might be from another team - even someone who hates soccer...ALL ARE WELCOME who come with good hearts. Luckily it has been a positive space for everybody, and rather popular. People have been confirmed, been married, baptized, very beautiful things have happened in that place. That´s great, beautiful. A quiet love without prejudice is what I feel in there. There are also players who have gone to pray, to meditate. It´s very good that it continues to be a hallowed place, obviously, but where anyone can go and feel good. Whether you are an atheist, Jew, Muslim, Buddhist, quemero [tr. note: Huracán supporter], archbishop, head of government ...it doesn´t matter. The only thing that matters is to be respectful towards the chapel and the place, the beliefs of others. The other thing is that it has nothing to do with the return to Boedo. It´s part of it for whoever wants it that way, a place to think that subject over if you like, of course - but, from my point of view, it has nothing to do with institutional policies. When we return, the chapel will be moved to Boedo, or another one will be built if necessary. Places and things don´t matter. What matters is what you put in the place, the feeling that you bring, no? Well, nothing...that´s it. Ah, by the way, we are going to put in new glass, more similar to the design and colour of the tiles on the tower. Viggo, to me, religion was created while we were sleeping and was institutionalised when we woke up. I already told you about the Santa Cruz church, in the neighbourhood of Boedo and to which I´m devoted. I think it´s great what you say about it (the CASLA chapel) being a place open to everybody, whatever religion they are, since it´s in exactly those places where people intermingle where the most interesting things come out. The opposite of fascism and puritanism: the métissage [tr. note: the mixing of races], that thing which makes it possible that a gringo born in New York, who was raised in Buenos Aires, Chaco and Denmark, who sometimes lives in Spain can also be friends with a forty-something guy who was born in Boedo, and who lived his childhood and adolescence under a military dictatorship. And that both should love the colours of the champion. The colours of this love. Fabián, I don't know if I told you that since we finished filming Todos tenemos un plan I've been working in Spain. We're doing the rehearsals for the premiere of Ariel Dorfman's Purgatorio. By the way, Dorfman, who was brought up in Chile, was born in Caballito [tr. note: Caballito is a neighbourhood in Buenos Aires, north of Almagro and Boedo] and he likes Ciclón. Anyway, it's been a while since I visited the cuervísima Gandulfo family in their lovely bar El Rincón del Cid in León city. I was able to visit them this last Sunday and it was a great pleasure, as always, to be with them for a while. I met them in 2005 while shooting Alatriste. There are no better San Lorenzo supporters. It was they who gave me the homemade flag which now has the signatures of all the Matadores, undefeated champions in 1968, and also of Hector Facundo, also a champion with San Lorenzo, in 1959. Well, as it happens they are going to officially open the Peña Cuervos de León. There aren`t very many yet, but gradually they're adding new Cuervos. Their bar is in León's center and is very well known. The Gandulfo are well-loved there and, as the place is full of photos, pennants - all kinds of San Lorenzo memorabilia - the number of supporters is growing. They'll soon have their web page working. © Peña Cuervos de León. Finally, as I'm talking about Spain, I've one thing to say about mister Mourinho. He has just received the Marca award for being selected as the best coach of the Spanish League in the last tournament. That's absurd. It's obvious that it was Guardiola from Barcelona who was the best - and not only in Spain, but in all of Europe. I'm saying this as a Real Madrid supporter. I hope they win the League, and I think they can do it, but I don't think it's good to reward someone who wasn´t the best, though he's talented and shrewd. The only thing he's done better than anyone is to behave like a delinquent, a negative force, a terrible loser. In the end, what remains after all the discussions about him, is exactly that: he's a terrible loser. Shameless Mourinho pokes Tito Villanova in the eye. Until the second leg [of the tournament], brother Cuervo! Thanks for the chat, Fabián. © Viggo Mortensen/Fabian Casas/Club Atlético San Lorenzo de Almagro.